Born in the latter half of the nineteenth century, Henri-Victor Lesur was just seven or eight years old when the Franco-Prussian war broke out. It was a tumultuous period in France. 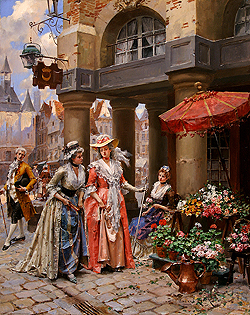 Leading up to these struggles, France’s history had been punctuated by other social and economic ills, brutally portrayed by the adherents of Realism, who had been given a strong presence in society not only through their works displayed at public exhibitions, but also through the writings of Émile Zola and the art critic and champion of Realism, Champfleury. 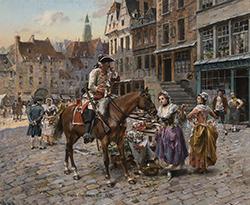 While Realism continued to be a strong presence guiding the work of many artists, some grew weary of these depressing images and sought to assuage their wounds by admiring the gay images reminiscent of eighteenth century French artists such as Antoine Watteau, François Boucher, and Jean-Honoré Fragonard. For a moment the public could revel in these playful scenes and forget the ills that still plagued much of the population. 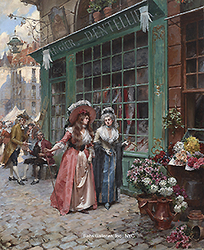 One artist who portrayed daily life with the frivolity of past masters was Henri-Victor Lesur whose images represent an era of bygone luxury and playfulness, set against the backdrop of Paris. 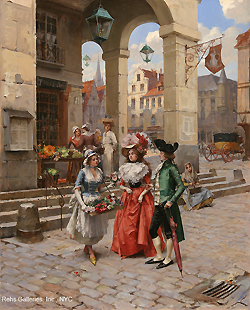 Henri Victor Lesur was born in Roubaix on April 28, 1863. His early life, before he entered the Ecole des Beaux-Arts, remains a mystery. At the École he studied under François Flameng, an academically trained artist who also depicted scenes influenced by the masters of the eighteenth century. 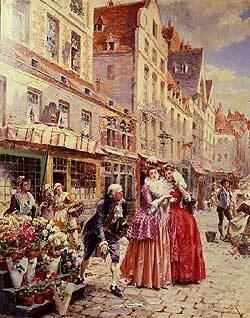 Flameng’s painting and tutelage was instrumental in forming Lesur’s style and theme of painting. 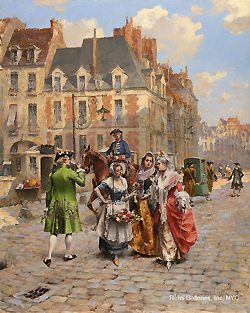 Lesur debuted at the Salon of 1887 with Saint Louis Enfant Distribuant des Aumônes (The Young Saint Louis Distributing Alms) for which he received a third-class medal, an impressive debut for a young artist. That same year he also won a traveling grant. Since the majority of his Salon entries are portraits, not views inspired by his travels in foreign countries, it is unknown where he went. These portraits, given Lesur’s talent and interest in depicting themes and figures which recalled bygone eras of pomp and splendour, must have found suitable patrons in the bourgeoisie who sought a glamorous and idealized form of self-display. Among these were a Portrait de M.J. Stirling Dyce (Portrait de M.J. Stirling Dyce), Salon of 1888; Portrait de M.M. Caplain (Portrait of M.M. Caplain) Salon of 1890; Portrait de M. Alfred Loreau (Portrait of M. Alfred Loreau) and Député du Loiret (Deputy from the Loiret), Salon of 1892; and lastly Portrait de Mlle. Wanda de Boncza…(Portrait of Mlle. 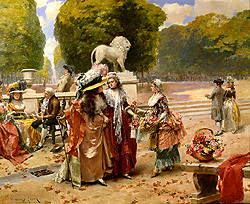 Wanda de Boncza), exhibited at the Salon of 1895. Lesur also took part in both the 1889 and 1900 Exposition Universelle, receiving bronze medals at both. 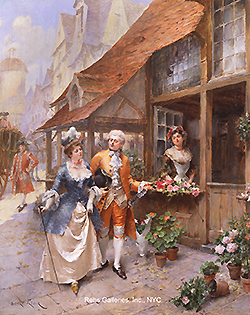 While Lesur concentrated on submitting portraits for entry into the Salon, his other works depicted the upper echelons of society engaged in playful behavior, often costumed in sumptuous garments of rich satins and silks. 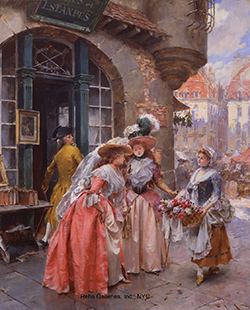 The artist Alfred Stevens once remarked that “…the public are attracted to costume subjects in the same way that they fall in love with the fancy dress of a masked ball.” As with many of his contemporary highlife genre artists, Lesur often painted these works on small wood panels, creating a more intimate work and a need for careful examination by the viewer, also perfect for display within a bourgeois home. 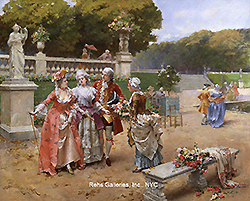 The majority [of the Naturalists], however, changed their style to utilize decorative ensembles, pastel hues, and fashionable themes that were reminiscent of a bygone Romanticism even though they still derived their subjects from contemporary life. They no longer wanted to paint life as it was, however. The suffering and misery around them, though no less prevalent, were not only difficult to paint but did not appeal to buyers . 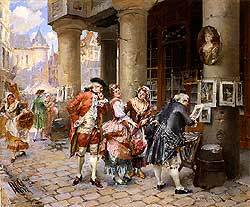 Collectors did not want pictures that marked the failures of progress, nor did the public who came to the Salons want to be reminded of the beggars and the homeless always surrounding them. Art was supposed to be pleasurable. 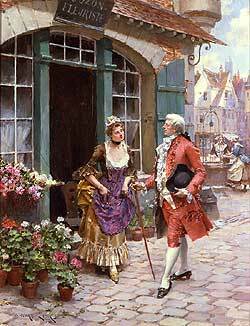 Social reform, as a purpose for art, therefore gave way to elegance. Pictures were no longer intended to educate the masses, and, however much they might proclaim otherwise, artists again sought to associate themselves with the wealthy of society. Thus, the grand, descriptive scheme of the early critics-that art confined to actuality would improve the world through a depiction of poverty, distress, and old-fashioned virtues among the humble-had largely disappeared by 1900. 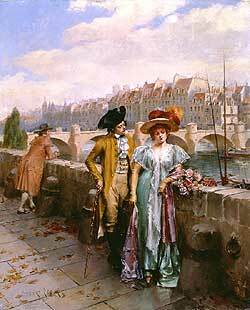 Thus, Lesur was taking advantage of the changing notions of French society and painting compositions that were far removed from either Realism or Naturalism as noted in the quote. Lesur’s career ended early. He exhibited at the Salon for the last time in 1895 and he died in 1900. The exact date of his death is unknown. Very little has been written about Henri-Victor Lesur’s life and his placement within nineteenth century art is difficult. 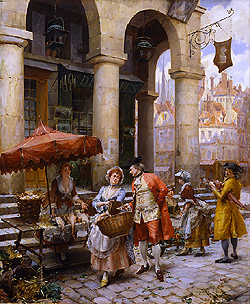 It is clear that he was an adherent to a form of painting that was influenced by eighteenth century artists but which was also stamped with a sense of modernity in that his compositions were clearly recognized as a form of escapist art dictated by the growing contempt for the unpleasant veracity of other artistic styles. And in a time of industrialization and modernism, Lesur’s compositions look to the past and reflect upon a period devoid of the complications inherent in such a transition. In effect, he used the eighteenth century to create fanciful images that helped the purchasers of works to escape into a mythical historic past.